Be bold, and consider a different shape when making your next tag! Sure, its easy to take a scrap rectangle, and cut the ends for a standard tag, but it can be just as easy to make a fun die‐cut tag. The next time you have your die‐cut machine out, take some of that leftover cardstock and matboard and cut out a few random shapes. Pop them in a sandwich bag and you have an instant stash of fun cut outs for gift tags! 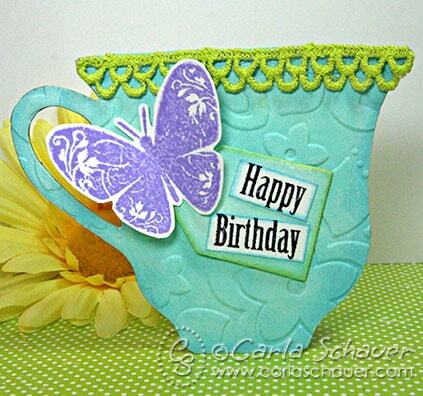 I made this teacup‐shaped birthday tag using pieces of the XL Teacup Die by Eileen Hull. I quickly ran the teacup shape through my Big Shot with an embossing folder to add the flower texture, and inked the teacup and tag with Seaglass and Aqua pigment ink. I also added a bit of Lemon Grass ink around the tag edges as an accent to match the scalloped lace (also colored with the Lemon Grass ink) glued to the top of the cup. The purple butterfly was an extra from a previous project (Hampton Art), and the “Happy Birthday” phrase is from my Lots of Thoughts Design Adhesive set, used with Plum Crazy foil on white paper strips. The tag went together just as quickly as a standard‐shape tag would have, but it looks much more special for my niece’s party next week. My friend Eileen Hull (who designed the die I used above) is hosting a Scoreboards Linky Party to show off some fun spring designs using her die collections. She’ll also be giving away the Fringed Flower Die as well! Enjoy! such a great idea to use an embossing folder on the die cute shape! It’s perfect! I love how you embossed it too. I use the teacup all the time. It’s so versatile and a timeless, fun shape. Carla, sorry I didn’t stop by to comment sooner… Love your take on the teacup‐ that one remains a favorite of mine and great idea to use it as a tag. Fun colors too‐ it looks like you 🙂 Thanks! Welcome! I'm Carla, a licensed artist, maker, and creator of quirky art and craft projects. Here, I share DIY crafts and creativity of all kinds, occasional studio updates, and a wee bit of everyday life. New? Start here. art and content © 2009-2019 Carla Schauer · all rights reserved. If you'd like to share something from my site, please share ONE image and then link back to my post where people can read the full tutorial/content. Please DO NOT alter or copy photos nor copy my work in its entirety to share on your site without my permission. Some posts may contain affiliate links. 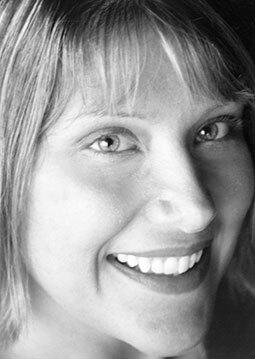 Carla Schauer Designs is a participant in the Amazon Services LLC Associates Program, an affiliate advertising program designed to provide a means for sites to earn advertising fees by advertising and linking to Amazon.com. See full disclosure.